The new cedar post fence is an old style fitting with our county’s history and in the spirit of renewal our town is enjoying. It will be extremely durable and low maintenance. 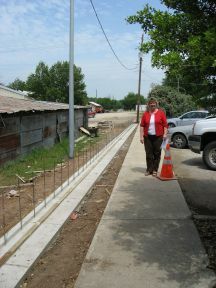 It’s an environmentally responsible fence, using recycled oil field pipe and local renewable resources of cedar posts. The design also correlates with the xeric theme of the library landscape- because by removing cedar from watersheds we’re conserving precious water resources. When we first approached Lynn Hamrick, who shares the fence line with the library, he was supportive of the project and tore down the old fence at no charge. David Williams was instrumental in getting the work area cleared for construction. Brothers John Pat and Emmett Lee Grumbles donated funds to help with the landscape cleanup in preparation for the project. Local artist, Sandra Deans, donated her skills to produce a beautiful illustrative watercolor of how the area would appear with a new fence and landscaping. This greatly aided us in our presentations to the Friends of the Library and the Commissioners Court. 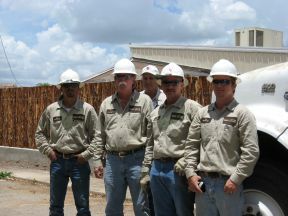 We are appreciative for the donation of pipe from Kennith Stewart Pipe Yard. 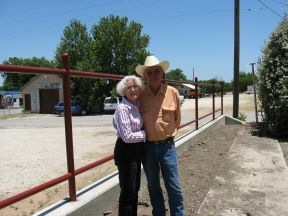 Kennith and Patsy Stewart were eager to help from the beginning and were most gracious as plans for the fence evolved during the process of building which required much more pipe that they had originally offered to donate. When we consulted with Robert Trujillo of Trujillo Fencing about peeling the cedar pickets, he donated himself and his crew to weld, paint and erect the fence. It is truly an art form to properly construct a cedar picket fence. We were very fortunate to have Mr. Trujillo’s help. 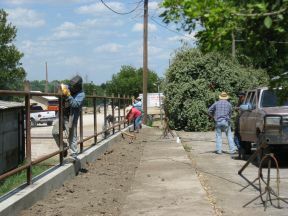 John Byrd donated the hauling of the 600 posts from Lampasas as well as helping with fence design and irrigation plan and installation. County Judge Byron Theodosis, the County Commissioners and County Attorney David Williams were encouraging of the project and voted to spend a portion of the library fines and donation money to help with it’s completion. 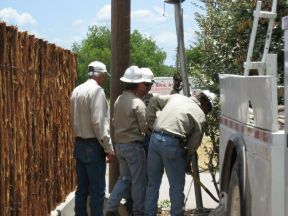 Scott Glaze, Roger Verette, Larry Alderson, Denver Daniel, Mike Argote and Jake Lackey, all City of San Saba employees, donated the moving of an electrical pole that was in the center of the newly created flower bed as well as spreading dirt in the bed. Winter Texans, Mr. and Mrs. Durrell Williams, gave generously to the project and we appreciate their help. 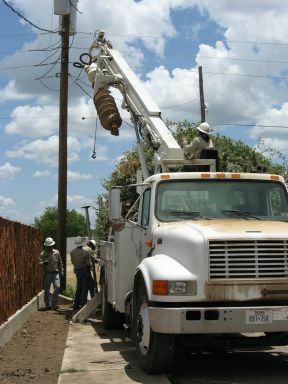 The Economic Development Corporation was supportive of our work and we’re thankful for their help with funding. There were also a number of donations over the past several years from San Saba County residents for which we are very appreciative. Last but not least we thank the Friends of the Library and President Carolyn McDowell for giving their whole-hearted encouragement when the idea was first presented to them in February and providing the critical start-up funds.